This extraordinary handbook was inspired by the distinctive concerns of anthropologists and others who film people in the field. The authors cover the practical, technical, and theoretical aspects of filming, from fundraising to exhibition, in lucid and complete detail—information never before assembled in one place. The first section discusses filmmaking styles and the assumptions that frequently hide unacknowledged behind them, as well as the practical and ethical issues involved in moving from fieldwork to filmmaking. The second section concisely and clearly explains the technical aspects, including how to select and use equipment, how to shoot film and video, and the reasons for choosing one or the other, and how to record sound. Finally, the third section outlines the entire process of filmmaking: preproduction, production, postproduction, and distribution. 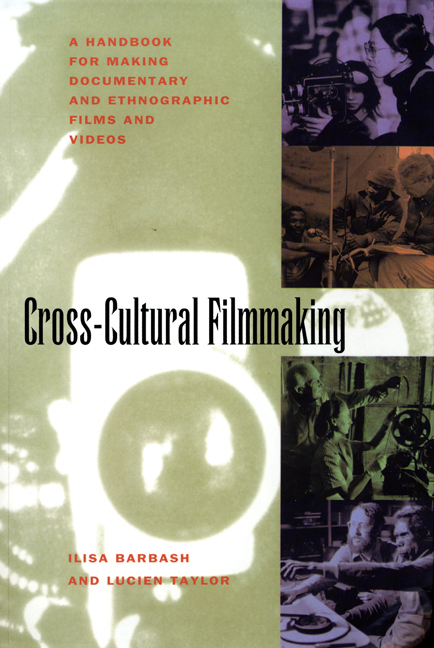 Filled with useful illustrations and covering documentary and ethnographic filmmaking of all kinds, Cross-Cultural Filmmaking will be as essential to the anthropologist or independent documentarian on location as to the student in the classroom. Ilisa Barbash and Lucien Taylor have recently served as visiting professors at the Université des Antilles et de la Guyane in Martinique. Taylor is the editor of Visualizing Theory (1994) and edits the journal of the Society for Visual Anthropology, to which both authors belong. Together they produced the award-winning video, In and Out of Africa.